NEW YORK — Cuban President Miguel Díaz-Canel, right, was greeted by a crowd of more than 1,500 at Riverside Church in Harlem Sept. 26. He was here to speak for Cuba at the 73rd General Assembly of the United Nations. “This is a meeting of solidarity,” he noted, with long-time opponents of the U.S. embargo against Cuba’s workers and farmers and supporters of the Cuban Revolution. The Cuban president made a point of saying how much he enjoyed speaking in Harlem, one of the historic centers of the struggle for Black rights in the U.S., where the Cuban Revolution has always had many friends. Some 42,000 Cuban internationalist volunteers are currently working in more than 75 countries, he said. Since the triumph of the revolution in 1959 more than 1 million Cuban volunteers have provided medical care, fought to defend the independence of Angola against invasion by apartheid South Africa, worked on engineering projects, and provided agricultural and sports training in some of the most underdeveloped regions of the world. Venezuelan President Nicolás Maduro also attended and gave greetings. 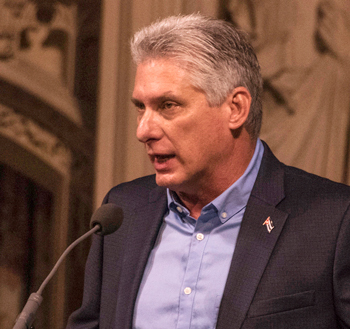 Díaz-Canel’s packed schedule included addressing the U.N. General Assembly, and meetings with local elected officials, the U.S. Chamber of Commerce, large farm representatives seeking to expand trade with Cuba, artists, Hollywood actors and others.